Unlike most of the world, Russia celebrates Christmas on January 7. This year Russian Christmas fell on a Sunday, and the Moscow Good News Church took the opportunity to commemorate the birth of our Savior in a number of special ways. Our children, teens, musicians, singers, and dancers all joined in the celebration, using their talents to glorify God on this wonderful day. 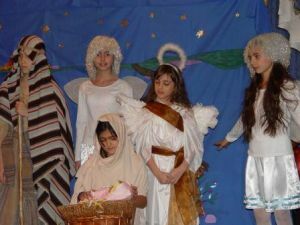 Our Children�s Ministry held a special Christmas program, featuring a theater production about the birth of Christ, as well as special games, songs, dances, and a puppet show. Our Generation X junior high ministry enjoyed their own unique Christmas program with special music and drama performances geared for their age group. For the adults, the Christmas service began with a mix of traditional and contemporary Christmas songs, which was followed by a short ballet performance from our dance team. But the focal point of the service was the message, taken from Luke chapter 2. Pastor Rick expounded on Jesus as the Lamb of God, using his historical and scriptural knowledge to bring new life to this familiar passage of Scripture. Thirty- five people responded to the altar call that day. After leading the new believers to Christ, Pastor Rick served Communion to the church. Regardless of the day on which it is celebrated, one thing remains constant on both sides of the ocean: Christmas is a time to honor Jesus, who was born in a manger to one day die on a Cross and who was raised from the dead so we can be reunited with the Father forever! Rick and his wife, Denise, have a powerful ministry in Russia. Pastoring thousands of people, they constantly implement outreaches for thousands more in the city of Moscow and all over Russia.